Bed bugs are the oval, seed-shaped, reddish bugs that crawl in your bed and feed on you while you are asleep. They do this at night because it is easier to attack their prey. Us humans also release carbon dioxide in the air as we sleep and that is mainly what attracts bed bugs. These little night crawlers are notorious for causing itchiness and redness on your skin if you have the unfortunate experience of them biting you. Unless you had bed bugs before, many people will not notice that they have bed bugs at first. Over time, there are very distinct signs to look out for when looking for bed bugs. This is your ultimate Bed Bug Guide, and we will begin by discussing the signs, move into pest control, landlords, and bed bug prevention. Always be aware of the signs of a bed bug infestation. It is important to frequently check around your home to see if there is a possible infestation, so that you may take care of it earlier rather than later. Infestations can spread quickly so it is imperative to take action as quickly as possible. Identify whether the bug is a bed bug, as sometimes people mistake them for carpet beetles. Other places bed bugs can be found hiding is in or near piping, underneath the mattress, in the box spring, any cracks whether it be on the bed frame or the wall, and the headboard. Other places include: the wall crevices, screw heads, drawer joints, and electrical outlets. If you find bed bugs in your hotel room, immediately notify the receptionist. Should you leave back home when finding bed bugs at the hotel or should you ask for another room? Leave the bags at the door, eventually outside the room with someone from your family then go inside and use the steps above to thoroughly inspect for bed bugs. Well this is a tricky question because by moving you may also help spreading the bed bugs to the new room depending on how long you have been already staying in the bed bugs room. But you also don’t want to blow the chances of good times and leaving back home might not sound as the best option when you are all pumped up for your hotel stay. That’s why it’s very important to check the room for bed bugs right when you get in before unpacking. Once it’s confirmed all good then get everyone in with the bags and start enjoying your vacation. According to BlogTO, Toronto is growing in the number of bed bug infestations and has one of the largest in Canada. Despite being one of the largest cities, the main problem is that Toronto has 40 million visitors annually which in turn, easily invites pests in. It is no wonder that Toronto, among many other north american cities have some of the highest infestation rates. Heard About Neighbors Having Bed Bugs? Should You Move? One of the most horrifying things to learn is that your neighbour has bed bugs! It can be scary and something you really do not want to deal with, but certain precautions should be taken when your neighbour has this problem. Landlords whose tenants register bed bug complaints will be instructed to hire qualified pest management professionals to treat the infestations. Instead of just treating the apartment where a tenant has complained, the owners will now also have to inspect and treat the apartments next to, below, and above the infested units. If your neighbour recently informed you about a bed bug infestation, do complete a thorough inspection of your home as mentioned above to prevent an infestation. In the case you suspect bed bugs, complete a deep cleaning of your home, especially the bedding, your clothes and the surrounding furniture. As bed bugs can easily crawl from one unit to another, be aware that they can come in through nay small cracks you may have so it is best to patch them up as soon as possible and cover up any little entrance they may have. Landlords are the sole proprietors that are accountable for the treatment costs. Technically, it the responsibility of both the tenant and landlord to immediately fix the problem. The landlord, superintendent or property manager holds the responsibility of ensuring that the property is pest-free and that rules and procedures are discussed in the case of an infestation. If you find that you have a bed bug infestation in your home, you should immediately notify your landlord, or condominium manager. They will hire a pest professional to inspect your home and determine the best treatment method. Everything comes with a price and this time it will be the responsibility of your landlord to pay for the treatment. Otherwise, if it was you who brought in the bed bugs, then the payments could be put on you. Landlords will typically be the one to pay for the treatment (or their insurers). In the case that you have been living in the home for an extended period of time, it is more likely that the blame will be put on tenant. Bed bugs are those annoying little pests that crawl in your bed and feed on your blood as you sleep. These tiny, red bugs are persistent and will find any way to get to your exposed skin. After feeding for several minutes and engorging their bodies, they will hideaway to their nest, somewhere in or around your bedding. Bed bugs can live 5 months to a year without having a blood meal. Bed bugs are hitchhikers and they love to travel. If you are a frequent flyer, you may be succumbed to bringing a bed bug home with you and creating a whole new infestation. IF you so happen to have a single female bed bug in your home, she can lay up to 500 eggs and they can hatch within 10 days. Keep in mind that bed bugs have been around for thousands of years. Since then, they have become extremely resilient to pesticides and insecticides and are not as easy to get rid of as before. Their shells have become immune to products that you will need harsher chemicals to completely get rid of them. How Serious Could a Bed Bug Infestation Be? Regardless of the severity, you should always call a pest professional to handle the situation as they will make the best decision on how to treat the bed bugs. I’ve Got Bitten by A Bed Bug – Now What? If you happen to get bitten by a bed bug, do not panic. Most of the time the bites are harmless and will disappear after a couple weeks. Symptoms of a bed bud bites include, itchiness, swelling, red welts, and inflammation causing irritation to the skin. People react differently to bites, but if you notice that your scratching has made the bite worse, seek medical attention as soon as possible. Bed bug bites look like small red welts and usually are patterned in 3’s. Bed bugs will crawl around until they come across exposed skin as you are sleeping. They will begin by injecting a fluid to the feeding spot so that they will go unnoticed. They will then draw blood until they become fully engorged. To take care of your bed bug bite, rub calamine lotion on the affected area. Other products such as baking sodas, any anti-itching creams, and/or aspirin are all effective treatments for bites. DIY Bed Bug Treatment: What to Use? Safety is a priority when using any DIY method when getting rid of bed bugs. For decades, people have tried using many different products. To many, it can be surprising that many products that you think may work are actually a myth and how no long lasting effect to successfully getting rid of bed bugs. Washing your bedding: Doing a thorough wash and clean of all of your bedding is proven to kill bed bugs because the immense heat your laundry dryer produces. This is a great way to kill the existing bed bugs. Ensure that your dryer is at 140 degrees Fahrenheit and set for 90 minutes to completely kill them. Freezing bed bugs: This method is another successful way to kill bed bugs as they can only withstand a certain amount of cold temperatures. The temperatures must be below 0 degrees Fahrenheit to actually kill a bed bug. Any item you have that has been infested can be put in a bag and left in the freezer for 4 or 5 days. Vacuuming: Owning a powerful vacuum can help you in situations like this. This will get rid of adult and baby bed bugs nymphs as well. After you are finished vacuuming, you should remove the bag outside in a trash can and never inside your house as some may still be alive and will keep crawling back. Diatomaceous Earth: This is a popular product for ridding your home of pests. By applying a specific amount to the seams of your mattress and surrounding furniture, it will cause dehydration to the shells of the bed bugs body and they will die. There are of course pros and cons to using it: it poses health risks and using a large amount will only scare the bed bugs away. Using diatomaceous earth alone will not solve a bed bug infestation but it can successfully kill some of the bed bugs. Everyone loves to try DIY methods, but they are not suggested. IF you are thinking of mixing certain shelf products that you found at home or in your garage, it may not be the best for your health and could pose danger to you and even your pets. Many consumers do not read labels and end up using outdoor products inside on their furniture to try to rid the bed bugs but this can cause serious damage to your health and your belongings. The more common and suitable DIY methods are vacuuming, ashing/drying clothing, steaming, and using mattress encasements. These are the most effective ways to get rid of bed bugs without an exterminator and are proven to help kill some bed bugs. Although these are effective methods for killing bed bugs, it does not clear up the infestation problem completely. When removing your clothing from the dryer, shake them off so that all of the bed bugs will fall off and securely seal your clothing in clear, plastic bags. Call professional pest control as soon as you notice that you have a bed bug infestation as to take precautions so that it does not spread to other rooms in your home, or if living in an apartment, into other units. If you live in Canada, you can visit www.pestworldcanada.net to find a professional. If you live in the United States, you can visit www.pestworld.org. As a tenant, it is your responsibility to cooperate with your landlord in treating bed bugs. The simple answer is YES, you should tell your landlord of a suspected bed bug infestation and you should do it right away. A reminder that you must write out your complaint/situation to your tenant immediately within 24 hours so that they may come in and inspect the property. If You Are a Home Owner, Should You Tell Your Neighbors? On a forum called Bedbugger, home owners asked their community whether they should tell their neighbors about a bed bug infestation. Collectively, all answers led to the same conclusion: Yes, you should inform your neighbors of a bed bug infestation so that they, too, can take protective measures and be aware of it. Are Bed Bug Treatments Covered By The Government in US and Canada for Home Owners? No, bed bug treatments are not covered by the government. Bed bugs are an issue that tenants and homeowners are required to take care of as this is a result of a maintenance issue. The costs of treatment are considered to be under the owner’s responsibility and will not be covered by any type of insurance. Do You Have To Call Public Health Or Any Other Agency In Case You Have An Infestation? Not necessarily. It is best to call a local pest management company to investigate the situation before taking any drastic measures. On the City of Toronto website, homeowners and tenants may submit a bed bug sample picture, and a professional will identify whether the bug you saw was actually a bed bug. Do You Need to Throw Away Your Clothes, Toys, Furniture, Electronics? No, you do not have to throw away your clothes if you have bed bugs. The simple answer to this is throwing your clothes into the dryer for 30 minutes on the highest heat. This tumble and temperature will kill the bed bugs and you will not have to throw your clothes out. Also, you do not have to throw away any of your furniture. By doing this, you can cause the infestation to move into another dwelling and make things worse. What to Look for When Choosing a Bed Bugs Exterminator? Are you licenced in (insert city/state here)? Can you please provide me with references and reviews? Do not hesitate to ask questions and really get to know your exterminator so that you can rest easy knowing that they will get the job done efficiently and successfully. According to Home Advisor, the average cost of bed bug treatment can range from $300 – $5,000USD. The average cost for homeowners is between $1,000 – $2,500 USD. Does Being Expensive Means The Pest Control Is Better Than A More Affordable One? Usually, when things are more expensive, they produce better value. It all depends on the business itself and their reviews. Always do your research before you make a choice on who to hire. Set aside money in the case you ever need it for a situation like this and you will not have to scrounge for cash if it happens. Should You Choose a Bed Bugs Exterminator from Kijiji? Buying any type of product or service online can be tricky. It is recommended to search up legitimate pest control companies to help you. If you live in Canada, you can search for local pest professionals on the Pest Control Canada website. If you live in the United States, you can visit the United States Environmental Protection Agency (EPA). According to the University of Minnesota, the insecticide treatments will take 2 – 3 visits from the PMP to get rid of bed bugs. What Do I Need to Do in Order to Prepare for a Bed Bug Treatment? To prepare for a bed bug treatment, the infested items should be placed into bags. Do not try to move any of your furniture. Double bag any items laying around and clear out your clutter for maintenance. Clothing should always be double bagged. Ensure you clean up the other rooms in your home and do not leave any items laying around in the open. For more information on how to prepare for your treatment visit CityBugs.tamu.edu. How Invasive Is a Bed Bug Treatment? The invasiveness of a bed bug treatment varies depending on the severity and size. The treatment will be used only in the space and surrounding areas of where the infestation is occurring. It will take some time to get the job done as bed bugs are very resilient to pesticides. Will They Treat The Walls, Basement, Patio / Balcony, Outside The House? Typically, pest control will only treat the common infested areas such as the bedrooms and living / family room. Do I Need To Live Somewhere Else For A While, Like A Hotel, Parents, Friends, Etc? If you have a spare place, you may stay there until the treatment is complete, but since the professional will likely use chemicals, it is recommended to stay at a nearby hotel for a night or two depending on how many treatments are needed. Will It Be Safe To Live Somewhere Else Until The Process Is Done Or There Is A Chance I Will Carry Bed Bugs Where I Go? bringing with you to stay somewhere. If I Need to Stay Over for a Couple of Days, What Should I Bring with me so I don’t Carry the Infestation? infestation. For your luggage bag, use a pest spray before you place your items in the bag. For extra caution, place your clothing and belongings in clear, sealable plastic bags. What Are the Best Pest Control Methods to Get Rid of Bed Bugs? As previously discussed, the best methods to get rid of bed bugs are vacuuming, steaming, using the dryer and washing anything that was infested. These are also the safest methods to get rid of bed bugs. Although these methods get rid of the bed bugs that are only visible, they do not prevent nor successfully get rid of the infestation. Proper treatment by an exterminator must be performed for optimum results. Should You Go With Someone That Doesn’t Have Any Reviews Online But Is Very Affordable? No, do not pay anyone who is charging less and has no reviews online. Make sure you search for a trustworthy pest control professional who will do the treatments properly and safely. Should You Go With A Company Or Someone That Works On Their Own? It is okay to go with either one, depending on their experience and price. Never Had Bed Bugs, What Should I Do to Prevent Bed Bugs? your home for any signs of bed bugs. If you notice that you may have some bed bugs, call the pest control management as soon as possible because it becomes an infestation too large to control. You will know for sure after 6 weeks if the bed bugs are completely gone. Some signs will include: No more bed bug bites, no more red-stained bedding or furniture, no exoskeletons or baby bed bug eggs anywhere. What Are Some Bed Linens And Other Bedroom Products That Will Decrease The Likelihood Of Getting Bed Bugs? We found plenty of great bed bug mattress encasements on Amazon like this one. Don’t be too stressed if you have a bed bug infestation. Like any other insect, they will get destroyed by several chemical treatments with the help of a bed bugs exterminator. Also keeping the house clean and clutter free prevents them from returning or getting them if you never had issues. Did you know 97% of pest professionals responded to bed bugs calls for extermination alone in 2018? According to PestWorld.com, summer is their busiest time of year. The most common place bed bugs are found are in single family homes while hotels and motels seemed to have a slightly lower percentage. 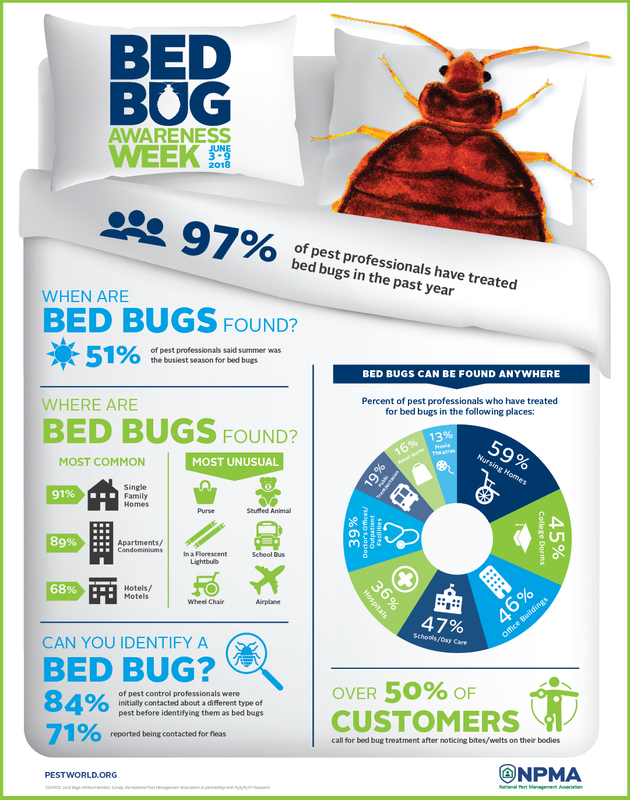 Lastly, because of a genuine amount of confusion, 84% of pest control professionals received calls about other types of insects where they were misidentified as bed bugs! Do your research and keep yourself safe! Good night, sleep tight, and definitely do not let the bed bugs bite!